Upma, the traditional Indian dish is made with semolina and veggies. 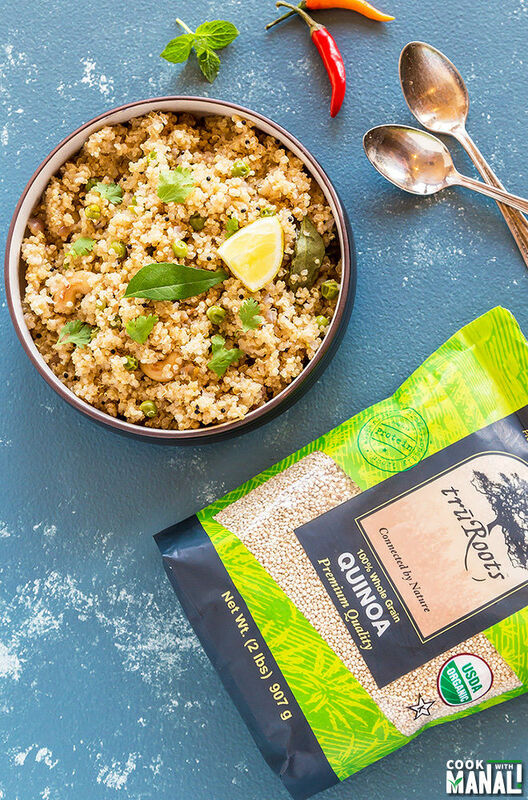 However, if you want to serve your family something more wholesome, try this Quinoa Upma made with quinoa. Tastes great with my favorite ginger cardamom chai! I always strive to make wholesome meals for my family, sure there’s an indulgent slice of cheesecake in between but more or less I try to keep it simple and wholesome for our daily meals. 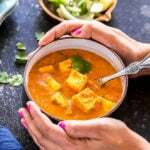 I grew up eating a lot of lentils, beans and those are a part of my everyday diet. However quinoa has been a recent addition to that list. I didn’t grew up eating it, but ever since I tried it for the first time some 5 years back, I never looked back. I often notice that people associate quinoa with salads, my husband is like that. 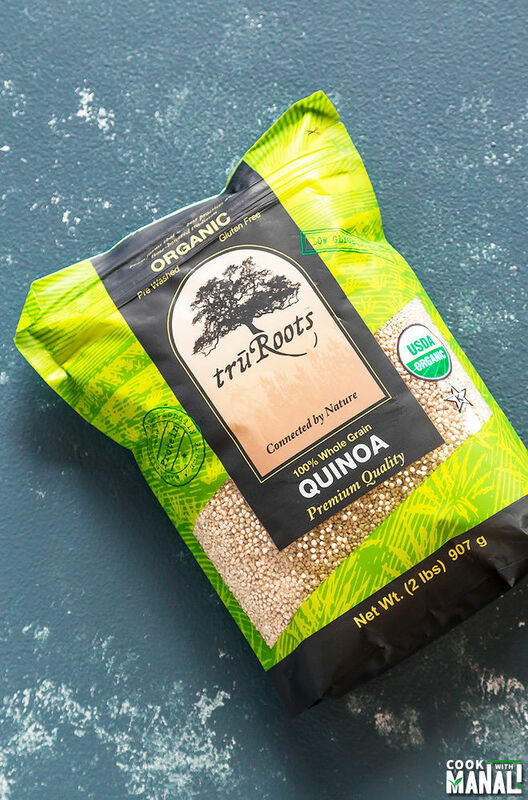 He always says that “oh quinoa is only for salads” but the fact is that it is just as good in anything and everything. 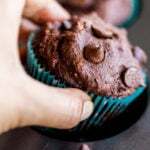 You can swap a lot of grains with quinoa in your favorite dishes to make them more wholesome. One of my favorite ways to do is by using quinoa in place of semolina in Upma. 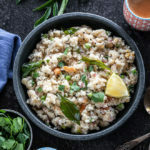 I am sure all Indians know about this dish, but for my non-Indian readers who don’t know – upma is a traditional Indian dish which is made of roasted semolina and veggies cooked together. These days I am hooked to the quinoa version of it! 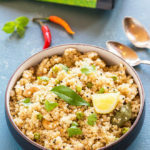 To make this quinoa upma is ridiculously simple using. It’s a one pot meal and doesn’t require much prep time or ingredients. I like my upma simple so I have only added green peas and onion here. But you may add any vegetable you like here like carrot and cauliflower would work well. 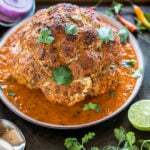 TIP: If you use cauliflower just chop it fine to make sure it cooks along with everything else. 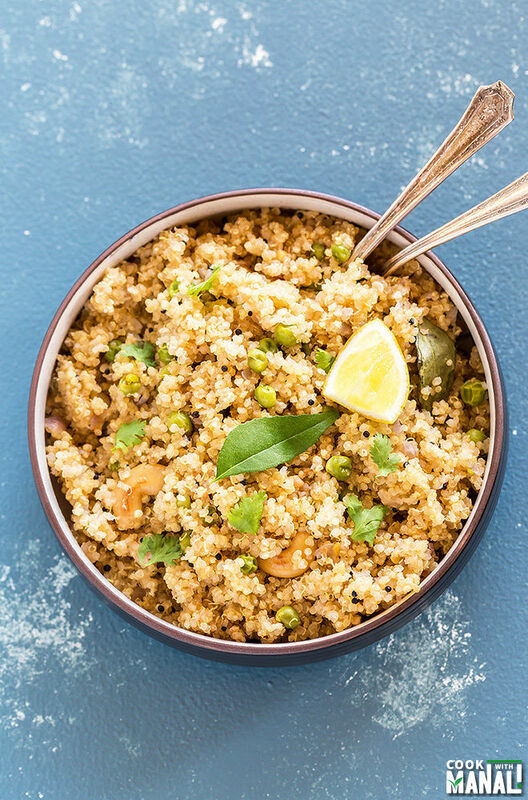 I remember making this quinoa upma last week and my dad loved it so much that he just kept saying that it’s like best quinoa dish he has ever eaten! I think he’s biased like any father would be ? but this stuff is good and you can trust me on that. 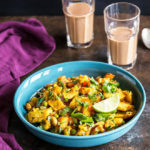 We all enjoyed this upma with hot masala chai. I love family time like this where we all sit back and eat a hearty meal and share a few laughs and of course chai! 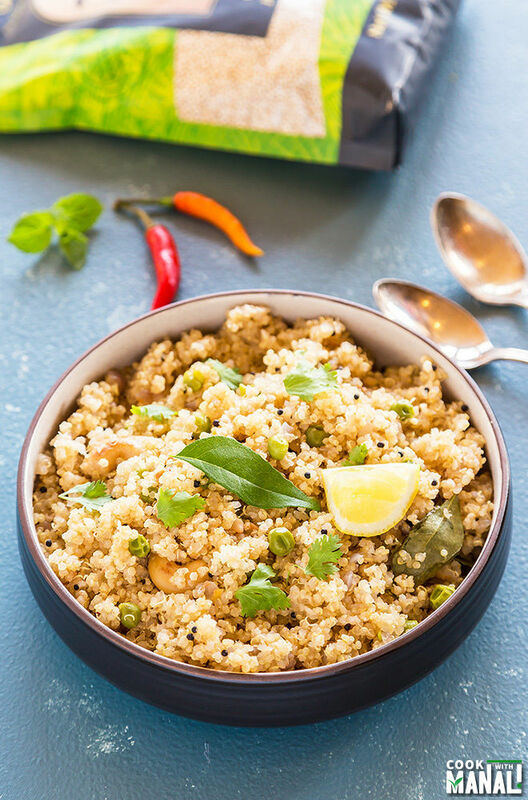 So give this traditional Indian recipe a new spin with quinoa and let me know how you guys liked it. Rinse the quinoa several times. Drain and set aside. Heat 2 teaspoons oil in a pan on medium heat. Once the oil is hot, add mustard seeds and let them pop. Add hing (asafoetida) and stir. Add chopped ginger, green chili, cashews and peanuts. Saute for a minute or two or till the ginger, cashews and peanuts turn light golden brown in color. Add onions and curry leaves. Cook for 2 minutes till onions are soft and translucent. Add frozen green peas and cook for another 30 seconds. Then add the rinsed quinoa and cook the quinoa with all the veggies and spices for 2 minutes. Add water, salt, red chili powder and mix. Once it comes to a boil, lower the heat to minimum (lowest) setting, cover the pan and let it cook for 15 minutes. After 15 minutes, remove pan from heat and let it sit covered for another 5 minutes. Open the pan, fluff the quinoa with a fork. 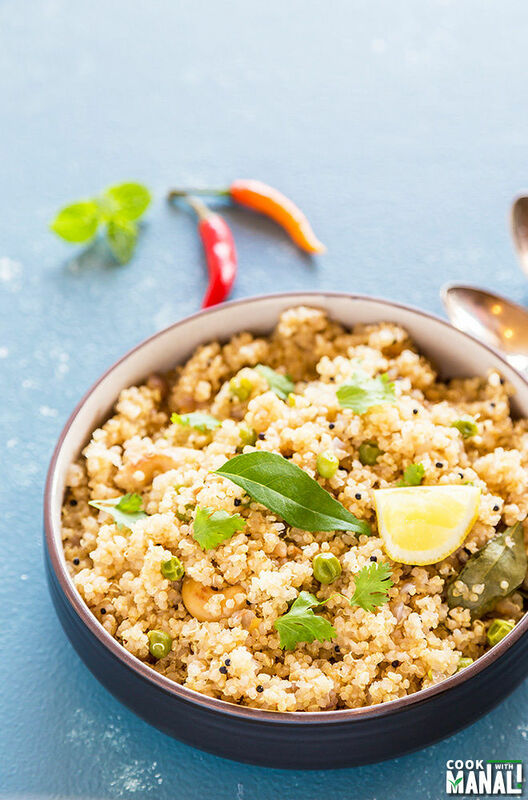 Add cilantro, lemon juice and serve quinoa upma hot with chai! Rinse the quinoa several times. Drain and set aside. Heat 2 teaspoons oil in a pan on medium heat. Once the oil is hot, add mustard seeds and let them pop. Add hing (asafeotida) and stir. 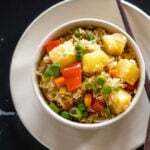 You may use other veggies in your upma like carrots and cauliflower. Make sure that the hing/asafoetida you use in this recipe is gluten-free if you wish to keep this upma GF! A simple, delicious and protein packed side dish! I’ve never heard of upma before, but I love the sound of it! Sounds delicious with the quino and seasonings in here! Oh, you know I love my one-pot meals….like so many people! And I am a huge fan of quinoa!! This dish is right up my alley, friend! 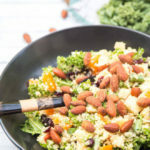 Hands down this was the best Quinoa recipe i have ever tried! 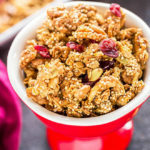 The nuts and veggies makes it very filling which is great for breakfast.